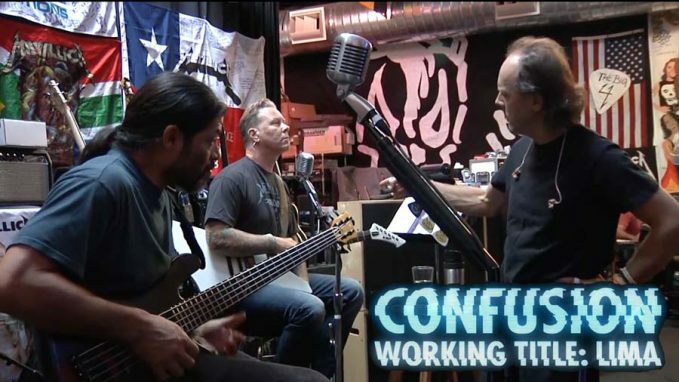 Metallica have released studio footage showing them recording the song Confusion. It features on the Metallica’s long-awaited 10th studio album Hardwired… To Self-Destruct, which was launched last month on the band’s Blackened label. Confusion initially had the working title of Lima, with the video displaying a number of stages within the recording process, together with Lars Ulrich, Robert Trujillo and James Hetfield jamming ideas collectively, James Hetfield laying down the vocals and Hammett recording his guitar components. It follows the band’s video showcasing their promotional tour in assist of the follow-up to 2008’s Death Magnetic which they launched last week. Earlier this week, Kirk Hammett mentioned he may perceive former Metallica guitarist Mustaine’s long-held anger at being fired from the Metallica. Hammett mentioned: “I have at all times shown a variety of empathy for him, understanding that he was simply pissed off. It is the equivalent of the lady of your life leaving you, when your music group kicks you out. I have never been kicked out, however I can imagine it is a horrible experience, particularly if it is a band that you feel really passionately about. Watch Pink Floyd's "One of These Days" Cover by METALLICAThe Metallica Quiz: "how much do you know about Metallica's BLACK ALBUM"?